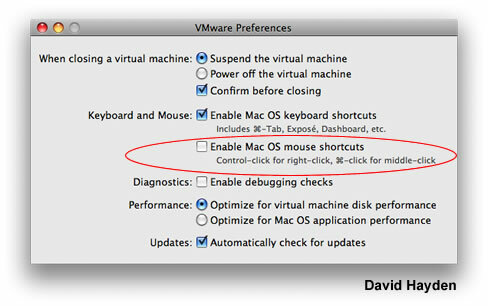 I don't claim to know all the different keyboard shortcuts and mouse settings that are different between a Mac and PC, but I do know that from time-to-time ( even when in VMware Fusion running Windows XP SP3 ) I shake my head when I come across unexpected behavior from what I have been used to from the many years of being on a PC. I typically just write down the annoying and unexpected keyboard or mouse shortcut and solve it at a later time. One such annoying behavior that I recently squashed in VMware Fusion is that on a Mac you can cause a Mouse Right-Click by holding down the Ctrl Key while clicking the mouse. I can see this being fairly important if you only have a mouse with one button, but who in their right mind doesn't have a mouse with both a left and right button? Buy either a Mighty Mouse or something you consider better that has at least a left and right mouse button. If on the trackpad, you can use one of the gestures to cause a Right-Click without needing to hold down the Ctrl Key. The problem with CTRL-Click being a Right-Click in Windows using VMware Fusion is that PC users will want to use Ctrl-Click to select multiple items. How annoying is it to want to select multiple non-continuous files in Explorer or multiple non-continuous items in a ListBox only to have it cause a Right-Click and bring up a context-sensitive menu :) It is really annoying. I am sure there is probably a good reason for those mouse shortcuts on the Mac, but they are down right painful on Windows XP SP3 or Vista. If you are a new Mac owner from the Windows PC world and using VMware Fusion and struggling with that problem, I hope this VMware Fusion Tip helps you out.